So, you want to learn to play golf. Awesome! Once you get beyond some of the early struggles involved in hitting a little white ball, you will be able to look forward to a lifetime of exchanging stories, true and otherwise, at the 19th hole. But first, we’ve got to get some of the basics down. What kind of gear will you need for that first trip to the local country club? Your First Set of Golf Clubs: If you’ve never played before wait until you are in love with the sport before spending hundreds on a great set of clubs. For the first few times ask to borrow a friend’s old set or check out a starter set at the sports store for about $200. It will include a putter, a driver, and a variety of woods, irons and maybe a hybrid club. It should come with a bag, a few balls and tees. You’ll quickly find the five clubs you rely on with almost every hole. Make sure to choose the right or left-handed set as needed. 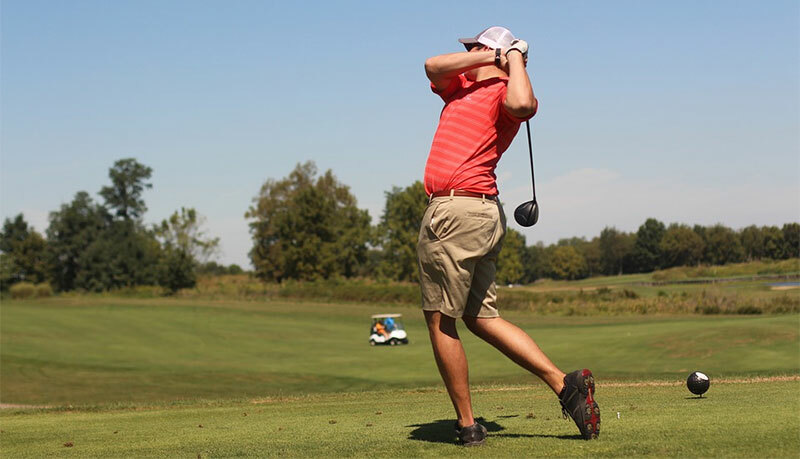 Shorts and Shirts: Dress codes still reign supreme at many golf courses, especially if you are attending a members only club. Check to find out what is permitted. Polo shirts and khakis are often the standard, but yours might allow more casual wear. For hot days, a pair of shorts with roomy pockets is very convenient for holding balls, pencils and score cards. Don’t forget a hat to help block glare and protect you from the sun. Golf Shoes? For your first day on the course don’t worry too much about the shoes. Your sneakers will do just fine. However, once you are entranced by the game a pair of golf shoes is recommended. They have large, round, rubber spikes on the soles that grab onto carefully groomed greens to allow you to find your perfect stance without slipping on the damp grass. Connect with the Pro: Even if you have mastered PGA Tour on your Playstation, you are not prepared for real life golfing. You might think you’ve got the stance and swing down, but you really don’t. If you want to be hitting the ball consistently from your first time on the links sign up for a few lessons with the local golf pro. They are going to help you figure out the physical differences between actually connecting with a ball and making your computer think you did. The Driving Range is Your Friend: No, it’s not nearly as fun as walking the links and laughing at your friend when their ball goes in the drink. However, when you take all the tips the pro gave you and apply them with an hour or two of practice, you will build the muscle memory needed to make an impressive opening drive at the course. Besides, this way you don’t have to actually hunt down the little white ball. Be Prepared to Fail: There’s a reason why golf is popular and another why only a very few people reach the U.S. Open as a competitor. Golf is seductively simple and ridiculously difficult. The golf course has been designed to make you think getting the ball to the cup is easy, but it was also made to trap your ball in the sand, the trees, and extra long grass. You’ll be much happier if you accept that the path of your ball will be wildly erratic for some time to come. Share the Misery with a Friend: If you take up golf so you can play against your boss with the super low handicap, you are only going to be frustrated and possibly embarrassed. While learning to master the sport share your successes with another rookie. It’s okay to hold off on the corporate showdown for six months until you know that reaching the green is something you can really do. Square up to the tee…: Every golfing tip you’ve ever heard repeated often is true. When addressing the ball stand square to the tee, keep your head down, follow the ball and don’t over think the moment. It’s practice and habit that truly sends your ball in the right direction time and again. Don’t Forget to Celebrate: Every golf course features the famous clubhouse. After spending hours hunting down a little white ball only to send it farther into the woods, you could probably do with a little liquid refreshment. Make sure to toast the winner of today’s round and commiserate with those who lost. It’s the human interaction that really makes this game special. It’s your chance to spend some precious face to face time in a world driven by emails and cell phones. Party on and sign up for your next tee-off time before you depart.